In this week’s motivational video, Chris talks about how to start your day right and set yourself up for success. He talks about the habits he uses every morning to make sure he is in the right mindset to deal with the day’s challenges. Check out the video below to hear Chris’s thoughts on morning motivation! Many writers need to create a fictional world for their stories to take place in. In this week’s video, Chris talks about how to build a fictional world. He covers four different considerations that will influence your world: physics, specific regions, resources, and nature. Watch the video below to see how these will help you create your world. In this week’s video, Chris talks about how to consistently hit five figures a month on Amazon. In addition to fast/consistent releases, you need things like box sets, promos, and ad spending to maintain a steady flow of income. Check out the video below for more information from Chris! 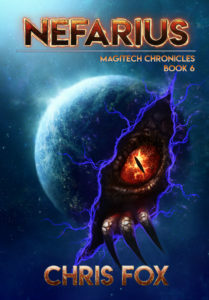 Nefarius, book 6 in the Magitech Chronicles, has been released on Amazon! Voria, Aran, Nara, Crewes, and more continue their struggle against Nebiat and Krox in the fight to stop Nefarius from being reborn! Krox’s assault on Shaya has been foiled, but the cost was bitter. Ternus lies in ruins, its gravity doubled by a god. Shaya is a paradise, but one populated by a mere handful of survivors. Only one power strong enough to oppose Krox remains… The Last Dragonflight. Aran and his Outriders travel to Virkon to wake Virkonna, praying that she will join the war on their side. But neither Krox nor Nebiat is the true threat. Nefarius’s rebirth has been carefully orchestrated, and is finally at hand. When the dust settles gods will die. Heroes will fall. The sector will never be the same. Read Nefarius now on Amazon! This week’s video is a quick tip about condensing characters. Bit parts in a story are often not memorable and some of these can be condensed into a single character, which can make them a bit more memorable. Check out the video below for Chris’s thoughts on it! Hate math, but want effective advertising for your books? In Friday’s video, Chris talks about using the aggregate sales model for advertising (with some very basic math) and gives some practical examples. Check out the video below for the details! Everyone has problems juggling their time at some point or another. In today’s video, Chris talks about his struggle to do so as an author. How do you balance being productive with not being so productive that you burn yourself out? For Chris, part of this is saying NO. Watch the video below to hear his thoughts! Hope Is Not a Strategy is a new anthology in the Four Horsemen universe, and it features a short story by Chris, entitled Without a Shot. Fifteen of the best Indie authors. Fifteen extraordinary stories. One bestselling universe. It’s the Twenty-Second Century. The galaxy has opened up to humanity as a hyperactive beehive of stargates and new technologies, and we suddenly find ourselves in a vast playground of different races, environments, and cultures. There’s just one catch: we are pretty much at the bottom of the food chain, and there’s only one way for humanity to move up—by becoming mercenaries. In every mercenary’s life, though, there comes a time when things go wrong and even the best laid plans go awry. When they do, though, the best mercs fall back and work out new plans, and you can bet on one thing—hope is not their strategy. Whether you’re a kid looking to get off your planet, or an unarmed merc facing an overwhelming force, or even the sole survivor of a pirate attack, there’s always an edge—and it’s up to the merc to find and exploit it! 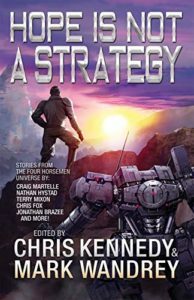 Edited by bestselling authors and universe creators Chris Kennedy and Mark Wandrey, “Hope is Not a Strategy” includes all-new stories in the Four Horsemen universe by some of the bestselling Indie authors currently in the business. These authors take on various aspects of the universe, giving you additional insight into a galaxy that isn’t at war…but definitely isn’t at peace. There’s only one thing for sure in the 4HU—anything’s possible…for a fistful of credits!